Back in August I wrote about how to more accurately identify if the insects in your home are in fact bed bugs by using glue traps to catch them and then calling 311 to find out how to send them to the New York City Department of Health and Mental Hygiene (DOHMH) laboratory. I came across this web site yesterday owned by entomologist Richard Fagerlund, who calls himself "the Bugman". He seems to be offering to identify bed bugs and other insects so long as you're willing to pay the postage to mail them to him and a small donation. Here's the text from his site if you don't like clicking on links. canister or something similar so they will arrive intact. the proceeds from this service will go to animal welfare. He'll probably do a faster and better job of identifying bed bugs than the City will. The other update is that the DOHMH has released two bed bug pamphlets, a general one and one for those in the hospitality industry. Both publications are available only in PDF format. Bed Bugs: Beware the Wrath of Charlie! I figured I'd give you guys a break from all the hard news (bugs sprays, City Council hearings, etc.) and give you somethng a bit more light-hearted. 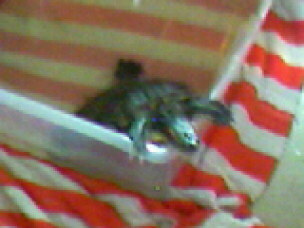 Meet my family's pet turtle, Charlie. He eats broccoli and meatballs, but one day I discovered my 13-year old nephew was catching cockroaches and feeding them to him. From then on, whenever I'd spot a bed bug anywhere in the apartment, I'd bring it right to Charlie, whose appetite made sure that bug would never bother me again. So far I've fed about a dozen or so bed bugs to him over the last two weeks. I guess you could call Charlie a form of organic insecticide. Watch out, bed bugs! I contacted Councilwoman Brewer's office and asked for copies of written testimony given at the hearing. They haven't gotten back to me but I was able to find excerpts from one bed bug expert (An expert excerpt? Say that five times fast! ), Gilbert Bloom of the New York State Pest Management Association in Pest Control Technology magazine. Below are some excerpts from the excerpts. Here, Mr. Bloom bluntly states that if a bed bug task force is formed by this bed bug bill, exactly what the task force should do.